Modern day slot machines have done away with the reels and LEDs in favour of video slots. The new video slots allow for a lot more features because they are designed using computer code and graphics. With the new modern way of playing slots, it is almost akin to playing a video stroke arcade game on your mobile, PC, laptop or live play machine. Graphics are sublime, sound effects crystal clear and there are plenty of smooth animations and game like movement with multiple levels. If you haven’t already guess, a video slot is a slot machine with computer generated reels and features. They can be found in Land Based Casinos & Online Casinos. They are highly interactive and come with arcade and console style bonus features. Plus, because they are computer generated, they can be played on mobiles, smartphones, tablets, laptops, iPods with internet connectivity and touch screen as well as on MACS and Desktop. They were first introduced in land based casinos by Walt Fraley. Fortune Coin was the name of the slot, and it became an instant hit. Then in 1994, the first online video slots arrived. One important thing to remember is that video slots are not just online virtual slots. They are basically any slot that does not have physical reels. If you go to any casino, you will come across a host of video slots and when you play online, well, obviously you can only play video slots because there is no way to play a physical machine online! Today online slots are the most advanced slots out there. However, the land based slots with their video screens can mimic the online slots and vice versa. When slots first hit the consumer market, they were relatively simple. They came with fruit themes and not much variety. 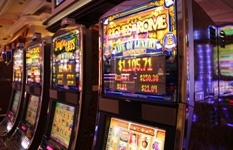 However, as computer chip technology came to light, the slot machine could be automated, added bonus games could be added, LEDs could show more features by indicating progress on bonus games and other features. With so many new ways to design a slot, there has to be away to separate them from one another to make things more diverse, which equates to making playing slots more interesting by giving player more variety. Soon, slots would come with themes. Some of themes of old include Indiana Jones, Cops and Robbers, Snakes and Ladders and more. Soon the first online virtual slot would be released by Microgaming, and from there, one new theme after another hit the marketplace. Due to the flexibility of computer programming, it was easy for video slot developers to design any theme at all for the online gaming market. Check out the DC comic themes available on online video slots right now. As we have mentioned, with the birth of computer generated slot machines (video slots) came a flurry of new feature and bonus add-ons. Computer graphical code means that the slot designers can now do just about anything. Look at Grand Theft Auto for instance. Yes, it isn’t a slot, but it gives an idea of just how computer code can create a whole new virtual world. Video slots have taken full advantage of this. When you hit a bonus round on a slot, some of them come with skill games. Some of them come with intense graphics and are computer controlled, while others are pick me games. Try Midnight in Paris – the bonus game on this video slot is pretty amazing. Great graphics rolled into a pick me round where you search out a museum thief in one Paris’s famous museums. Everyone loves free spins. Recently a new era of free spins games has been hitting the reels. Something that the physical reels could never match – at least not without some of mechanical genius anyway. When the free spins starts a different set of reels come up on some of the newer virtual slots. Something a live slot would find it difficult to do due to their reels being physical and so unchangeable. Literally the list is endless and it all happens within a split second because this is a computer game run by coded graphics that gives designers real flexibility. Wild reels are when an entire reel turns into wild symbols. This can happen during normal play, but there are also a lot of free spins round that will introduce the wild reel. Now basically every spot on the reel will turn wild. Usually most new video slots come with stacked wilds, which are clumps of wild symbols all on the same reel adjacent to each other. Some slots will introduce these instead during the free spins round. Better still, during the free spins round, the reels will add a new symbol to the stack after every spin. On some recent releases like Star Burst from NetEnt, some features lock the reels. This is something that actually can happen on live non-video slot based machines. It has been replicated to video slots play too. The reels can lock up into lines of combinations helping bring in more wins. Some symbols actually split on virtual slots. This means that you may land a single symbol and it can turn into 5 symbols on the same spot. Therefore, if you land 5 of them, and they all split into 5, you have a symbol combo of 25 of a kind. Right now because there are so many slots out there online, and there are so many slot players, the win ratios over the years have moved further in favour of the player. Casinos don’t mind losing the little bit of profit they could make because that profit is still very high. Most video slots have a win ratio of 95% or above. Some, such as Big Bad Wolf from Quickspin come with a ratio of 98%. On the other hand, land based slots are not quite so generous. Despite having a mix of classic, physical and video slots, there are only a limited number of players because unlike the internet, a physical location’s reach is much less. When you hear so many terms being thrown around for video slots it can be tough to distinguish between them all. Multipayline slots versus classic slots is a good example. Both multipayline slots and classic slots can be video slots. As long as the slot is played on a graphical interface, then the slot is a video slot regardless of any subcategory it may come under. Therefore, a video slot can also be a classic slot or a multipayline slot and so on. As any slot can be a video slot as long as the reels are software generated, this means several types of slots can come under this category. Many of these slots comes with different ways to bet. For example, a multipayline classic slot with 3 lines will have a different way of betting to a 25 payline modern slot. However, in essence the concept is the same in most cases. Always check what the maximum and minimum line numbers is that you can wager. Each line you bet, will require a separate amount wagered. So if you bet 1 line and you set the bet per line at $1.00, then the spin will cost $1.00. Increase this to 3 lines, and the bet will be $1.00 per line, so $3.00 a spin. This is quite simple. Put your money in, select the stake amount and spin. Each time you spin, the stake amount set will be deducted from your slot balance. When you come across slots with 1 payline you may also see that you can bet that 1 payline more than once by adding more coins. Usually this is up to 5 coins per line on most classic 1 payline versions. The concept is simple. If each coin is worth $1.00, then 1 coin on the payline will cost you $1.00 per spin. If you wager 3 coins on the single payline, this is x3 $1.00 bets, so $3.00 a spin. Usually to up the number of coins, you will see a Bet1 feature. Each time you press this, a new coin will be added. You can also use a Bet Max button, which will automatically bet the maximum number of coins allowed per spin. Usually the multiline multi coin slots are the most played slots. They can be confusing and when you add in the ability to select a minimum or maximum number of lines, this can all get a bit too much for new players, but once you’ve mastered it, it become like drinking water – naturally! You want to bet 20 lines at the minimum bet. The minimum bet is the lowest coin value across the lowest number of lines you can bet. However, this 20 payline slot in our example says you must bet a minimum of 20 lines and 1 coins per line. Note that for later in this example, the slot allows 10 coins per line! Each coin can be worth $0.01, $0.02 or $0.05 for arguments sake. For the minimum bet, you need to value your coins at $0.01 each. As the minimum number of lines is to bet all 20 lines, your bet is now $0.20. Now you start to become more confident and you want to bet double the minimum. Well this is very simple. You keep you bet at $0.01 per coin. You then select 2 coins per line. Now you have 40 coins (2 coins per line). The bet is now 40 x $0.02 = $0.40 per spin. After winning the massive progressive jackpot, you can now bet the maximum. You set your coins to be worth $0.05 each. You then select 10 coins per line. So 20 lines x 10 coins is 200 coins per spin. Each coin is worth $0.05, therefore, 200 coins x $0.05 is $10.00 a spin. On the progressive video slot machines you can win millions. This is because the progressive jackpot on the slot never stops rising and it is connected to a progressive jackpot network on most cases. Live video slots and online video slots can connect to these networks that basically connect all the versions of that progressive slot around the world into one place. This way the amount contributed to the progressive jackpot, which is a percentage of every bet, will not only rise quicker, but it will be much bigger compared to a machine with standalone progressive jackpot. Non progressive video slots have a set jackpot. It is fixed and cannot be changed. That’s pretty much the only difference. Video slots are amazingly flexible because they use computer code. This has allowed programmers to add almost anything they want to the video slot and the way it is played. They are the most popular slots out there today and come with some highly interactive entertainment. With their flexibility, they can be played both live on a slot with a video screen or online via smartphones, tablets, laptops and PCs. One of the most notable aspects is the fact that they come with some amazing features that spruce up the entertainment for the player. They also come as classic slots, single payline and multipayline slots. Finally, they also offer great pay back percentages. Due to there being so many online slots out there today with a global reach to anyone connected to the internet, the online casinos can afford to give people better win rates, and so the video slot has risen to fame.